"Sometimes the best way to get the job done is to do it yourself. " Those words inspired music producer Richie Branson (born Marcus Brown) to come into his own and make the decision to take his music career to the next level. Hailing from San Antonio, Texas; the 25 year old artist & producer took his first initial step into the music industry in 2009. Branson joined forces with music producer Jeremy "J.Forbes" Brown to start the production company Red Prodigy. Within months, Red Prodigy's signature sound was co-signed by top executives in the music industry. Def Jam's President, L.A. Reid, personally offered a record deal to one of Red Prodigy's signees, Demarcus "Bone" Hamilton. As a jack of all trades, Richie's artistry, production, and engineering led Branson to co- produce Bone's debut single "Homegurl"; which stayed on the Billboard Hot 100 Hip-Hop/R&B charts for 19 weeks and reached a radio audience of over 9 million people. From that success, eventually Richie would go on to do production work with platinum recording artist The Dream, Bun B, Rick Ross and southern natives Chalie Boy and Slim Thug. Richie continues to differentiate himself in his hometown, his signature blend of hip-hop and pop music would earn him recognition as one of the best producers in town. The San Antonio Express-News featured Branson as one of the hottest up and coming producers in the industry. Branson was later nominated for the "best producer" award in the 2010 San Antonio Music Awards. Despite living in Texas, where the local music scene is known for its heavy bass and slow tempo, Richie has always had a passion for making fast upbeat crossover music that appeal to a global audience. In early 2011 Richie wrote and produced the single "Jersey Shore Fist Pump". 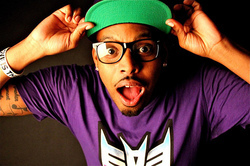 The infectious hit landed him a worldwide distribution deal with the New York based record label TuTone Entertainment. Hoping to capitalize off his previous successes, Branson now dives into the world of Nerdcore pop music and is marching to the beat of a different drum than most artist. After releasing mixtapes like The Cold Republic (Star Wars series), Gundam, Wing.Zero, and the song "Letter To Squaresoft"; his buzz has spread within the online gaming community faster than any other artist in the Nercore genre. Because of his ability to produce, mix, write, and perform his own music, he is completely self sufficient. He is able to adapt and create in any type of style, whether it appeals to the signature hip hop sound of his fellow Texas natives or whether it carries a more worldwide appeal. The highly animated swagger and catchy word play he delivers on every song put him at the forefront of a movement that will have people around the world moving to the beat. Branson's current drawing board includes releasing and promoting Wing.Zero mixtape and continuing to make music that his fans can relate to. Outside of music, Branson is driven by fast cars and has aspirations of building his own race car someday. What makes Branson unusual is "I'm on some Clark Kent / Superman ish. By day I am a signed recording artist and street racer by night."